My wife had called and left me a message, so I returned her call at 1:00am. and we chatted for a while about normal things, had the children gone to bed, had they eaten and she said not to worry about them, they were all ok where they were, and suddenly a missile fell and the mobile went dead. I tried calling her back but it was not connecting. I went to the door and there I heard someone outside saying, the shelling was for the Shae’r house. I tried not to believe this was happening where my children were… I ran and was the first to reach the house. The house was totally demolished. People came to help and move the rubble. I became nervous and hysterical, so I was taken to the hospital. The next morning, I found out that my wife Nehay and four children had died, and my two daughters were injured… The house was targeted because of Fouad al-Shae’r, my wife’s cousin. ...Fouad was not in the house when it was hit, he is alive and well. His father Mohamed al-Shae’r was killed and his brother was injured, and my wife’s three brothers, Atef, Eissa and Hani all died. On Sat Aug 2nd at 3:00am. My husband was in the living room watching the news. The kids were asleep and my baby was crying so I went to check on her. At that exact moment everything changed. The electricity was cut off, I couldn’t see anything. I didn’t hear the explosion. But the ground was shaking and the door slammed and was locked. It took them almost an hour to open it. My kids were under the rubble – all injured with shrapnel. The neighbours helped getting us out and people came with torches. Then they found fathi ayata, our neighbor and his wife in our bedroom. Three of his kids died and another three survived. In the maniarawi house, Ibrahim was on his own and he was killed. In Neireb – the wife and the free daughters were killed. Five days after the explosion, they smelled something weird like a dead body, and they found a dead girl under the rubble. Before that they thought that the parts that they collected were the third girl. Her whole body was under the rubble for 4 days. We had 8 killed in the four houses. At 2:30 while preparing lunch, my son Mohammed (12) was taking pictures of his aunt Saadiya telling her ‘I want to send pictures to Baba of what you cooked for us’, and also had his picture taken with her. My other son Youssef (10) was sitting at his aunt’s feet and playing with her grandson Rizq (8 months). The electricity had been cut off and I was sitting near the open door for air. We were all chatting, preparing lunch, taking pictures and suddenly the ceiling fell on us. I thought they were sending a warning rocket, but this one carried a gas, [raised dust? EW] we couldn’t see each other. I started taking everyone out and managed to take out four of the children, Nabil (Rizq’s brother), my daughter Zeinab (6) and Jana – Mohammed’s daughter and Dina whose mother was injured, and all the time I was reassuring them that it was just a warning shot. The young men who had been on the second floor came down and told me to stand aside as I was pregnant and could not keep going back in to take people out (they knew what I would find). I stood there and they came out carrying my son Mohammed, dead. I stood back and wanted to know what happened to the rest of my children, they were either dead or injured. My son Omar was in the basement when he heard the rocket and came out running to me, I told him that Mohammed had died and asked him to go find out if Youssef was still alive. The ambulance driver kept telling me to get into the ambulance, but I refused, I stood there holding Omar waiting for Youssef… I kept waiting. Rizq’s mother came out screaming “Rizq was in my arms, he flew from my arms”. Rizq had been with my son Youssef and died. A little later, they brought Youssef out on a blanket without a head or arms, only the lower part of his body. When I saw that Youssef was dead, then I accepted to get into the ambulance and went to the Kuwaiti hospital. It was said that the rocket was meant for a house nearby, they had sent a warning rocket a couple of days ago then made a mistake – a mistake and shot us instead. So they make a mistake and four people and a baby die – because of a mistake. 2nd August, Friday night, we are sleeping. Then at 1:00am we see the houses collapsing on top of each other. Six or seven floors – the house of my uncle Mohammed ‘Isa al-Sha’er (Abu Fuad al-Sha’er) and his children… The two children belonging to ‘Isa – their legs were wounded and broken. In the other house next door belonging to my brothers ‘Atef al-Sha-er and Isa al-Sha’er, also there was my sister with her children…She and her four children died… The building was destroyed on top of them. We began to gather the body parts up using an empty bucket. There was nothing intact. I was in my home, a small distance away from their home – about 5 metres away. When they bombed, there was no warning…They bombed us with F-16. Two rockets… As the bombs increase we are under increasing pressure to flee from area to area - some to schools. We were at home (in the Mashru’ area) on Friday, before the Maghreb call to prayer. The F16 airplanes appeared and hit us with over 15 rockets one after the other with minutes in between. They fell on all the homes around our house, including the Baladiyun - most of them civilian homes with nothing to do with anything. They were random hits. Before this happened, we wanted to leave, we were fed up. This was Friday night and my father was not at home, he’d gone out with my brother Munir to get food by car. He rang us and we told him not to come. I said it was dangerous as they were striking, what happens if they are striking and you come by car and get hit? You could die. He said OK. I put the phone down and I heard a car horn from far away and it was my father. We heard car doors opening and I opened the door for him and said ‘why Dad? We told you not to come. It’s not safe’. He looked at us and laughed, and said ‘I don’t want to die by myself. You think I’d die and leave you? All of us must die together.’ Friday 11:00pm. We began to hear to sounds of tanks clearly as if they were next to our home. From far away, approaching. They hit our house. This belonged to my grandmother. ‘Hawn’ rockets and drones. I don’t know. They struck the house and I no longer saw what was happening as we hid under the stairs of my uncle Ibn Ahmed ‘Uncle Fathi’. We stayed sitting there. My younger sisters and father and mother were under the stairs in case anything happened. And I was on the stairs with my uncle and brother Munir. We were all watching, but hiding, wondering what was happening, where are they? The tanks were by right next to our demolished house, one side of the tank touching the fallen stones of our home, and continuing to bombard. And another in our street, one behind and one in front of al-Mashru’. There was no way of getting out of the area - impossible. Even if we fled from where we were, we would not be able to get out of the area. And the drones and bombardments. ‘What are we to do Dad’? ’Nothing of course. We stay’. He said laughing, as if nothing was happening, calming us down. Munir went up to the roof – without of course our father knowing – and he began to count the flags on top of the tanks. They reached about 37 and more just in our street, our area. Sometimes they fly above the roof. They were just the ones we managed to count before fleeing. We counted and came straight back down. We weren’t going to stay up there. He told me and my father and we went up to the roof. And sure enough. There were so many tanks. For every street, at least four or five tanks. And each one was bombarding the homes and people – wherever there were people. We came back down stairs. My father sat down and asked after us and laughed. He said: ‘don’t be frightened. We’re safe as long as we stay put’. The tanks were coming from everywhere, from every street as if in shifts: five would leave and another five would take their place going round and round. My father came back down from the rooftop and we sat and had dinner. We ate bread. My father kept telling us not to be frightened. He kept trying to phone but there was no signal. Tanks next to the house. It was impossible to phone. There was no line. After three minutes, we heard a woman screaming. ‘Help me, oh people! Help me! Where is everybody? Where are the men? Anybody?’ We could hear them [Israelis] as if hitting right next to our home. My father and I ran to the door. We said Jews or not, tanks or not, we are going to help this poor woman. She was next to our home with just a wall between us. We jumped up to go but my mother grabbed us. She said ‘no, you don’t go out’. We didn’t go out. Another 2 or 3 hours we looked out and we saw a Tok-Tok next to our house. There were children’s clothes, and milk, and Pampers, but nobody. They were taken. The woman and her husband or it could have been her brother. My father said ‘I wish I’d jumped and got her’. We sat back down. Another 2 or 3 hours later, 10 minutes away from the Maghreb call to prayer (Saturday), we stopped hearing anything. No sound, no cars, nothing. An unnatural calm. My brother Munir said to my father ‘see there’s no sound’. My father made bread and milk for my younger sisters. And we emerged from under the stairs and sat in the house. My father looked at the house which had been hit, and laughed. He fed everybody and got his chair and sat down in what had been my grandmother’s house and looked around at the bombarded house. After a little while, Munir came running to him and said ‘come and look’. My father said ‘come Mohammed’. So we went up to the roof. All the tanks were moving to Khan Yunis. Not a single drone, nor plane, nor tank remained in our area. There was nothing. We thought they had retreated. We thought the war had finished. We went up to the rooftop and saw the bulldozers, you know the type that have on them the big iron protection [iron canopy?]? From far away the bulldozer was demolishing buildings one by one. And it was coming towards us. The tanks had gone but the bulldozer was coming towards us. It hits, the house falls, it hits, half the building is knocked down, and it hits cars, anything in front of it. It was getting very close. When he saw this, we got out within five minutes. My father said we’re going to die. If we die, we die. What will happen will happen. So we all got into the car. All of the window glass was smashed. We all got in with our belongings. We went towards the ‘Balladiya’ area. I can’t describe what we saw. It was unrecognisable as our area. They weren’t our streets. The cemetery is better by a million times than those streets. Bodies and lamp posts on the street and there was not enough room in our car to carry them. People cut up, The Municipality ‘Baladiya’ was burnt and glass all around. Not a single undamaged building around. We got out and walked around. We went back to the car as quickly as possible as we wanted to get out of the area. The car tyres were torn, but he still continued driving. We arrived at the intersection of the ‘Mashru’ , the Ramallah intersection, when he looked. I looked, and saw three trucks drawn across to block the street. The rest of a tank, their windows covered in bullet holes and the tyres punctured. There were bodies in there. They had killed the drivers so that they block the road. In case anyone left they would be captured. I looked out left and right and saw bodies every three or four meters. Every three or four meters a child, a woman, a young boy, young girl. All dead. We were looking to see if there was anybody moving. But they were all dead. None of the bodies were intact. This was Saturday. We arrived in town. We fixed the car and windows. I felt my father, about ten to fifteen days before the war, began to withdraw from us, to the extent that if my younger brother had asked for a house, he would say ‘of course here you go’. Anything his children wanted, he would say ‘take’. Do you want a car – ‘take’, do you want a Vespa – ‘take’, however expensive it was. There came a time when we didn’t leave the house at all. But the last 10 days before the war began we went out every day. Every day by the sea, every day somewhere nice, he would pay, he would go out, have photos taken together. We all came to my uncle’s house. We sat down and he look at each of us in turn. His cousins came and greeted him. He said not one of you …. He didn’t expect that the next day he would be dead. We sat together, we got food and fruit. And we sat and laughed. Everybody let and shut the door. All my siblings slept. I sat up not sleeping, listening. I heard my father crying to himself. It was the first time I’d heard. It was difficult for me. He was talking with my uncle. He was remembering building his home stone by stone. He said the son of our uncle Mohammed was missing since three days and he feared he was dead or injured. Of course, when we first came, nobody could approach that area. Deep injury and he’s bleeding. I have to go and get him. My uncle said perhaps nothing has happened to him and he’s just hiding. It is dangerous for you. The next morning (I am awake) my father is unusually awake early at 8:00am my father was up wearing his’ galabeya’. He says: ‘I want to go and get our belongings from our home, we don’t have anything here and we don’t have money to buy new. I want to go and see what is retrievable’. I said no you’re not going to get belongings, I heard you last night, you are going to save the boy. I said I want to go with you. He said no. He said OK, wash your face and come with me. Then my brother Munir got up and said ‘You always take Mohammed, take me this time.’ My father laughed. And said, OK Mohammed, let me take Munir with me this time. I said the car is big enough for all three of us. He said no. Don’t fear. I won’t be much more than half-an-hour. And they left. They left in his car. They were being fired on as they drove away. Rockets, bullets. They were missing him because he was driving so fast. He said either I die or I get him. If he’s alive I’ll bring him back. He and Munir entered into our area and parked in front of the house. Then they walked a long way creeping until they reached the man’s house. They found the man’s house of five floors had been completely demolished. It had collapsed, my father was shocked. They searched for openings in the building, anything that had fallen, anyway to get in. They called. In vain. They went round side and found our neighbour’s house, also demolished but there was an empty space. He began to call. The man was on his last breath, almost dead. How his spirit came back even though his stomach was open - three days bleeding, - we don’t know how he sat up and said ‘here I am’, I don’t know. They broke down the door with their legs and put him on their shoulders and put him in the car and brought him here to the ‘Kuwaiti Hospital’. As soon as he arrived at the Kuwaiti, I knew something had happened. And my mother sent my younger brother to fetch my father. My father refused, saying he was not free. My father and Munir left again, passing by my aunt. He said ‘help me’. She said what’s wrong? He said my hand is burnt. She poured water on it and he had a drink. He said ‘this may be the last time I drink your water’. He and Munir drank and left to go and get our belongings. When he first drove out, they left him and did not shoot at him but on their return they were hit by a rocket. From the intersection of the ‘mashru’ until just before ‘Hamdan’ Hall. In the moment the car was hit I was in the Kuwait Hospital. And I felt something. By God I felt something. My friend was standing next to me. He asked why your tears falling? I said nothing was wrong and wiped them away. But I said my father was supposed to be back in half-an-hour and now it is two hours and he hasn’t come back. We are fearful for him. I hadn’t finished my sentence when he said there was a car hit on the Mashru’. An Ultra Mercedes car. I heard that news. Nobody can get to the scene, even the ambulances. Ambulances need a permit which takes two hours. Even if there were injured people, they would die within two hours. When he told me a car had been hit I heard in my ears my father and Munir shouting to me. Their last screams were in my ears. As if they were saying come and take us. I arrived in front of the Najjar Hospital. I rang my mother. I said don’t worry I’ll bring them, even if dead, I’ll bring them and if living I’ll get them out. And if something happens, forgive me mother. And I carried on. I arrived at the hospital. They fired a rocket at the intersection behind the hospital which blocked the road. I am looking around and seeing dust and rockets. If I stay where I am I will die. I had better carry on. I met my uncle Khaled on the way. My uncle said he went to the car he didn’t find them. Did you go to the cars? There’s only our car. I of course don’t believe. I feel there is something. I am going, sure that they are not living. My uncle said it wasn’t our car. I said Uncle are you sure? He said, yes, it’s not your car. Go back he said. I said ‘OK’ and we went back. I let him go a little distance so he couldn’t see me and then I went back and continued my way. And I walked and I ran and I reached the car. It was in flames. There had been four gas canisters in the boot. And when gas canisters are hit, they become white like burnt white. I couldn’t tell what colour the car was. It had been oil-green colour. He bought it two months ago. New. I looked at our car. At that point I was sure it was not our car. I looked at the wheel because there was a distinguishing mark made by my father using plastic and two screws. It’s our car. I look into the car, the fire appears to have gone out but it is still alight. There is nobody inside. I went round the back and found all of our belongings scattered around, burnt trays plates. I picked up a plate, it was ours. Our plates, our gas cooker, our TV. All our belongings. Then it came to me a thought which calmed me down, that I hadn’t seen the bodies not in the car, nor around. I saw open shops and houses and rooms. I began to shout for my father ‘haj’ and my brother ‘Munir’. I started to look in the shops for Munir. And I found their bodies 200 metres away from the car. When I found them, there were lots of bodies in front of them but none behind. Nobody was responding. I thought perhaps there would be injured. Look. Maybe they escaped and returned home. I carried on. I rang Munir’s phone and I heard it ringing. I said thank God. It was the ring tone I recognised ringing around me. I looked and saw it was thrown onto the wire. High voltage wire. He died and was on the ground and was thrown onto the wire. If it hadn’t been for his shirt, I wouldn’t have recognised him. I ran to him and pulled him off the wire. He and I both fell to the ground. I looked at him. His face and left hand were all burnt and all his fingers were cut off except for one, his forefinger. I embraced him. I turned off his mobile phone. And carried on cuddling him. I wondered where my father was. I looked around and found him strewn about six metres away without a head. I ran to my father but before I got to him I fell, fainted. I tried to reach him but I couldn’t. I called for help but nobody was around. Every time I tried to carry him I fell over. I fell to the floor and lost consciousness. Every time I woke up I saw him and so fainted again. I saw my uncle running in the distance. I thought I was dreaming and that none of this had happened. My uncle thought I was injured. When he got next to me he saw my father and brother. He screamed and collapsed next to me. We didn’t know what to do. We left. The ambulance came to take them and brought them to the Kuwait hospital. At 2:00am on August 3rd we were sitting around at home when suddenly without any kind of warning, we found the house on top of us – even the rubble from the neighbour’s house ended up on top of us. My house is in a refugee camp, made out of asbestos and parts of concrete, none of which can withstand rocket fire from an F-16 plane. There were twenty-four members of my family in the house at the time, 11 children, 5 women. We were awake, we don’t all go to sleep at the same time – we are in a state of war, I was awake. The distance between my house and that of Awad Abu Jazar’s home is a road measuring 3 meters. All of us in the house, big and small, were injured.There was no warning before the shelling, not even a ‘shivering’ of the mobile. All the houses in the area were damaged, they are all very close to each other, and after all it’s a camp.We just found ourselves under the rubble. Sunday, 3 August 2014, at about 8:00am, my wife, Ilham and the Hajja Tirkiya were baking in the ovens/bakery. They finished baking between 8 and 9. After finishing, my wife went to the bean seller... they were fasting and they wanted lentils for the break-fast. Almost immediately, a rocket fell on Umm Mahmud (mother of Mahmud - Ilham). We went to get her from the bakery and called an ambulance. It was delayed by about quarter of an hour so we decided to get a Tok-Tok. We met the ambulance on the way and went to the Kuwaiti hospital. While there, I received another phone call saying ‘send us another ambulance’. I asked what happened. They said just some workers in the Hammamat district had been bombed. Not 10 minutes later, the Hajja and my son Mahmud, and my cousin Mohammed Ihjazi entered the hospital. On Friday 01/08 news spread that there would be a ceasefire, so we returned home, my two sons and myself. I sent out my eldest son to the market to collect my wife and daughters so we could all have lunch together. The shelling started at 09:00 or 09:15. My son Yehia (who later died) stood at the balcony and told me people were running away. My eldest son called and said the police were not allowing anyone in to Abu Youssef al-Najjar because of the shelling and because they were escaping and told me to leave the house. Yehia and I left the house. We reached the Abu Youssef al Najjar roundabout when the first rocket fell ahead of us by about 13 meters. I was walking in front of my son and told him to walk behind me so if anything happened, the rocket would hit me and not him. I wanted to protect him. I fell and was injured in my right leg, when I looked next to me I found my son. He looked up at me for seconds and died immediately. While the first rocket was falling, two women to the right on the road towards Youssef al-Najjar, died. About a moment or a minute and a half later, the second rocket fell while I sat with my (dead) son, and nearby a young man in a blue shirt flew in the air when the rocket hit, I saw him literally fly in the air. Another rocket fell about 8 meters away from me, just 8 meters. A man yelled at me to move away, and asked what I was doing sitting there? He told me to move back, which I did, while the shelling continued and people were running, some were dying, many injured. I have no idea where exactly they were coming from – certainly from the Eastern areas, but I did not know who they were. While I was sitting there, I saw a little boy, probably in the first grade (elementary) with his little sister. The boy said “I want to stay with you, I don’t know where to go”. He stayed with me – obviously he had been separated from their parents when they were escaping. He stayed with me for 15 minutes while I waited for the ambulance, even though this area was unprotected, it was exposed, the block 15 wall were fragile, if you pushed them your fingers would go through, so just imagine what a rocket would do to it. I waited a long time for the ambulance, but it did not show up, so I walked to the hospital where I found my elder son and asked him to send the ambulance. They brought my (dead) son in and I said my goodbyes to him before they put him in the fridge, watched by the rest of my children. The doctor x-rayed my leg and said I had shrapnel in it and I would need a drip. There was chaos in the hospital, I was on the floor with many other patients. My son had to hold the drip in his hand while I lay on the floor. The person inserting the drip must have been a volunteer and not a medic as it took him a long time to find the vein – but I have to admit, I did not feel anything. My brother arrived to inform me that my sister’s husband and two children were in the hospital injured. My brother in law (60) had a broken leg and he had an injury next to his heart, and I cannot tell you how many shrapnel was all over his body, numerous number. Both his sons had head injuries. The younger boy, Usama (11) was in hospital for three to four days, and the older boy (17) is still in hospital with his father both in serious condition. It was a black day, I cannot think of a worst day. They were hitting the whole street, from Salah el-Din intersection to the Abu Youssef al-Najjar roundabout to the intersection of Ghaboun to the intersection of al-Madakha, then to where the Madakha road meet Saddam Hussain road. All those intersections were bombed completely. Not one nor two or four rockets…..you could see the effects on the people who died, it didn’t matter if they had just been passing by, and they were hit. I got out of the hospital when it had to be evacuated at around noon or a little later. My wife, children, brother and sister, nine of us, had to leave through the back door of the hospital (Youssef al-Najjar hospital) because the front entrance had un-detonated rockets. There was shelling next to the hospital, and a rocket fell in front of the back entrance. We left two at a time with my brother and I leaving last. We walked till the Genena district, where I stopped for a while to rest, I could not keep running, then walked on to my sister’s house – we could not go back to ours. The first incident happened on Friday, in Rafah. There was supposed to be a ceasefire. But there was rocket bombing in the eastern districts. Of course, people had been returning to their homes because of the ceasefire. Then, at approximately 08:20-08:25am, there was random rocket fire on the eastern district. People began to feel anxious and to flee. More exactly, the carnage which happened by the Bilbaesi supermarket. There were bodies on the ground; women, children, old men. Also we saw people ….. But we couldn’t reach them as there was so much rocket fire. People were imploring us. We got in contact with the Red Crescent to make us a permit for the eastern area and in particular Bilbaesi intersection. After more than an hour, with difficulty, we got to the eastern district and we found corpses (or severed body parts) belonging to women, children, elderly. We carried what we could … with help from our ambulance colleagues. The second incident was very unpleasant. In the area of Musabih, an (ambulance) car with ambulance personnel belonging to the Health Ministry was targeted. It had six people in it. When we reached the area, we found the car completely burnt out and we tried to put out (cool) the fire. We found six corpses completely charred. It was a sight beyond description. We got in contact with our colleagues in the ambulances to send us more (ambulance) cars as there were six bodies. At the same time, there were surveillance airplanes above us, above the car exactly. And a rocket was fired by one of these surveillance airplanes towards us. Then after about half-an-hour, a Mercedes-240 was targeted in the area of the Khibrat al-‘Adas intersection. When we reached there about half-an-hour after it had happened, we found corpses (or body parts); the driver and his passenger, and there were children in the vehicle. We took out the bodies. The bodies in the vehicle belonging to the Health Ministry were burnt, but those in the car were in pieces. Our shifts were from 8am to 8am the next day. During the war we didn’t have shifts, we just worked all the time. If I left, it was for an hour or so to change clothes and come back again. The third day, there was coordination for the eastern districts. And we went there with extra ambulances and rescue vehicles. And we found decomposing corpses, bodies thrown to the ground, women, children, bodies under mounds half visible. Bilbaesi intersection, eastern area of Zalata, Shawqa, we found decomposing bodies in the eastern district (east of Salah al-Din). 8.30 am we were sleeping in our home. We were expecting the ceasefire day to be a day of ceasefire but it turned out to be a day of war. There was no warning rocket. The dead were: My aunt Hajja Fadiyyah and my cousin Musa they were refugees from their own homes and had been with us for 10 days; my sister, her two children, and Jihad my 12-year-old son. I don’t know of any reason why we were targeted. There are no rockets in our area. Nor are we in the border areas. There is less than 200 metres between us and the hospital Najjar. There was shelling all night on 17/07/2014 by planes and artillery all around our house. At around 11 the shooting started. My neighbours family consists of around eleven to twelve people. Their house is constructed of ‘Baton’, they came over to our home and we stayed up all night. It was Ramadan and we had our last meal (suhour) and stayed up the rest of the night. In the early hours of the morning, we saw that people were running away from their homes in terror. It was a scene reminiscent of 1948, which we had only seen on TV. People were barefoot, women were running with their heads uncovered, a very difficult scene. A few days later my brother received a call threatening him to evacuate the house in preparation of it being shelled, fortunately the house was saved. We moved to my other sister’s home is about 600 meters from my family’s home. Two or three days later, a rumour spread that the home of al-Najjar nearby would be shelled, so we left again and went to an in law’s home, which did not work out so we moved to another relative’s home in Jenena and stayed there from 25/07 to 01/08. On 01/08, the ceasefire started at 8 a.m. We waited a while and left to go to our home with my three daughters, Rama (9) and Maram? And Aseel (who died). We left at 9 a.m. and arrived home by 09:10. We started cleaning the house, collecting broken glass and stones. Stone had fallen from the second floor on the first floor. We found a crater on the first floor as a result of the shelling. About 20 minutes later, we heard a huge number of rockets falling nearby. I would not be exaggerating if I told you that around 50-60 rockets were falling every minute. One of the rockets fell while I was in the house destroying the fence. Later, another rocket fell and the living room door flew about 3 meters from its frame. I decided to leave the house, especially after receiving a phone call advising me to leave to avoid danger and avoid the Israeli’s doing to us what they did in Shuja’iya. I left with my daughters and the wife of our neighbour walking towards ‘Muftaraq al Mashrou’ Amer’, 400 meters away. We left the house at exactly 11:01 and arrived there at 11:03. When we reached there I was surprised to find a trailer on fire with a Skoda or Golf next to it. I walked one meter behind the burnt trailer and found tanks in front of the Sa’ad Sayel barracks. The tanks fired at us. I had agreed with my daughters beforehand to walk in two groups separated by a distance of 10 meters in case were targeted; this way some of us stood a chance of being saved and not all would be killed. I took two of my daughters and my third daughter stayed with the wife of our neighbour. I crossed about 20 meters of Mashru’ Amer and looked behind me and did not see my daughter. When I asked the neighbour about her, she said that she had fallen. After crossing Salah el-Din Street by a meter and after the burnt trailer, I looked right and left and found the tanks on the right about 10-15 meters away. There were 4-5 tanks on both sides of the road. I looked for a safe house for the girls and the first house I came across was that of al-Sayed Hamdan al-Sha’er, known as ‘Ukush’. There was a pregnant woman and children and another woman crying and the owner of the house. I left my two daughters there for a few moments and went back to look for my eldest daughter. I called out to her in an effort to find her and save her. I could not move forward because of the heavy shelling. It was madness, an incredible number of rockets falling. When we found my daughter and brought her, it was the fourth day. There was shrapnel on her body because of all the rockets that fell around her on the street. They flew everywhere and carried stones, I kept one of them, it must weigh half a kilo, I kept it. I took the two girls and ran towards Abu Youssef al Najjar Street to try and find an ambulance. When I arrived there the ambulance were too busy because so much was happening in East Rafah and because no one dared go East of the hospital. The first effort to help my daughter took place two or three hours later. As we talked to the ambulance people, some people standing nearby offered to help and got a stretcher and went out to look for her after I had described the location where she fell. They were gone for two hours. I was really worried that something had happened to them. They returned as they were unable to move freely because of the heavy shelling. Three hours later and ambulance driver offered to drive out and look for her, he came back without her. I asked if he would take me, which he did and driving back to the Muftaraq we saw burnt cars and a drone shell fell in front of the ambulance narrowly missing us. When we arrived about 30 meters away from where she had fallen, we still could not find her. The tanks had advanced beyond the barracks in the direction of the South and West. We had to turn back without finding her. I spent five hours at the Najjar hospital and then the order came to evacuate it. As we evacuated I passed by the home of the Sarafandi family which had been annihilated – it added to my fears. I went home and waited four days, finally receiving a call from a woman who would not give her name at 6:15 a.m. She asked if I was the person who had lost a daughter and offered me her condolences and told me that members of the resistance had given her my number to call. I had posted an appeal on Facebook, radio and TV with my name and number to find my daughter. I followed her instructions and found my daughter in the location she described. Obviously my daughter had been there for four days, her body was decomposed, there were white maggots coming out of her body and it was swollen. Her legs were swollen and she had blood on her face, it was very difficult. She had a head injury, then I couldn’t look at her anymore. My brother looked and saw another bullet wound in her chest. She also had shrapnel on her body. I had gone there hoping to find her alive, she had had so many dreams and hopes like any young person her age. She just finished secondary school and was hoping to apply to university. She could not fulfil her dreams. We took her to the hospital and they prepared her very quickly for burial. We buried her in thinking and as she was, even her mobile and jewellery were buried with her – we had never experienced anything like this before. I could not let the other members of the family see her before the burial even though it is customary to, but I did not want them to remember her in her decomposed condition. I didn’t want them to remember her this way. Bombs dropped in Israeli air strikes fall on the al-Tannur neighbourhood of Rafah on the morning of 1 August 2014. © Said Khatib/AFP/Getty Images. On 8 July 2014, Israel launched a military operation codenamed Operation Protective Edge, the third major offensive in Gaza since 2008. It announced that the operation was aimed at stopping rocket attacks from Gaza on Israeli civilians. A ground operation followed, launched on the night of 17-18 July. According to the Israeli army, one of the primary objectives of the ground operation was to destroy the tunnel system constructed by Palestinian armed groups, particularly those with shafts discovered near residential areas located in Israel near the border with the Gaza Strip. On 1 August 2014 Israel and Hamas agreed to a 72-hour humanitarian ceasefire that would take effect at 8am that day. Three weeks after Israel launched its military offensive on Gaza, thousands of Palestinians who had sought refuge in shelters or with relatives prepared to return to their homes during the anticipated break in hostilities. In Rafah, the southernmost city in the Gaza Strip, a group of Israeli soldiers patrolling an agricultural area west of the border encountered a group of Hamas fighters posted there. A fire fight ensued, resulting in the death of two Israeli soldiers and one Palestinian fighter. The Hamas fighters captured an Israeli officer, Lieutenant Hadar Goldin, and took him into a tunnel. What followed became one of the deadliest episodes of the war; an intensive use of firepower by Israel, which lasted four days and killed scores of civilians (reports range from at least 135 to over 200), injured many more and destroyed or damaged hundreds of homes and other civilian structures, mostly on 1 August. 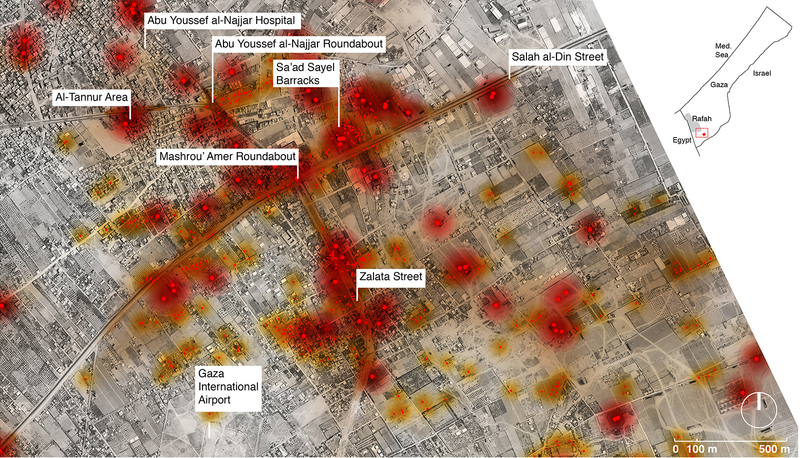 In this report, Amnesty International and Forensic Architecture, a research team based at Goldsmiths, University of London, provide a detailed reconstruction of the events in Rafah from 1 August until 4 August 2014, when a ceasefire came into effect. The report examines the Israeli army’s response to the capture of Lieutenant Hadar Goldin and its implementation of the Hannibal Directive – a controversial command designed to deal with captures of soldiers by unleashing massive firepower on persons, vehicles and buildings in the vicinity of the attack, despite the risk to civilians and the captured soldier(s). The report recounts events by connecting various forms of information including: testimonies from victims and witnesses including medics, journalists, and human rights defenders in Rafah; reports by human rights and other organizations; news and media feeds, public statements and other information from Israeli and Palestinian official sources; and videos and photographs collected on the ground and from the media. Amnesty International and Forensic Architecture worked with a number of field researchers and photographers who documented sites where incidents took place using protocols for forensic photography. Forensic Architecture located elements of witness testimonies in space and time and plotted the movement of witnesses through a three-dimensional model of urban spaces. It also modelled and animated the testimony of several witnesses, combining spatial information obtained from separate testimonies and other sources in order to reconstruct incidents. Three satellite images of the area, dated 30 July, 1 August and 14 August, were obtained and analysed in detail; the image of 1 August reveals a rare overview of a moment within the conflict. Forensic Architecture also retrieved a large amount of audiovisual material on social media and employed digital maps and models to locate evidence such as oral description, photography, video and satellite imagery in space and time. When audiovisual material from social media came with inadequate metadata, Forensic Architecture used time indicators in the image, such as shadow and smoke plumes analysis, to locate sources in space and time. He reported that the initial burst of fire lasted three hours. An artillery soldier said his battery was “firing at a maximum fire rate” right into inhabited areas. According to the report of an Israeli military inquiry, more than 2,000 bombs, missiles and shells were fired in Rafah during 1 August, including 1,000 in the three hours following the capture. According to the Israeli army, the initial strikes aimed to stop the movement of all “suspicious” persons and vehicles, to isolate the area until the arrival of ground forces and to target known and suspected tunnel shafts, which meant bombing residential buildings and agricultural installations suspected of harbouring tunnel exits or entrances. As the strikes began, the roads in eastern Rafah were full of disoriented civilians moving in all directions. Believing a ceasefire had begun, they had returned – or were returning – to their homes. Many decided to turn around, attempting to flee under a barrage of bombs and gunfire. Palestinian witnesses described jets, drones, helicopters and artillery raining fire at pedestrians and vehicles at the intersections, indiscriminately hitting cars, ambulances, motorbikes and pedestrians. “You see the hysteria of the children, destruction, and mushroom clouds, and you try to get as far away from them as you can,” said Wa’el al-Namla, a local resident and father of two. A collage of photographs shows the aftermath of the Israeli air strike on al-Tannur, in Rafah. © Al Mezan Center for Human Rights. Inam Ouda Ayed bin Hammad, a local resident, told Amnesty International that, after 9am on 1 August, she noticed the shelling intensifying and missiles landing in close vicinity to their home in the al-Tannur neighbourhood of Rafah. She and her family were on the streets seeking shelter elsewhere when a bomb hit a building nearby and killed her son Anas, her cousin Wafa and at least 14 other civilians, as well as injuring scores of other fleeing civilians. One of the scenarios that the Israeli military considered was that the captured soldier, Lieutenant Goldin, had been wounded and taken to the Abu Youssef al-Najjar hospital, the medical facility closest to the area of capture. The flood of casualties started coming into the hospital at about 10am, according to medical staff. The attacks around the hospital grew nearer and more frequent as the day went on. Studying photographs of the hospital, Forensic Architecture noted both internal and external damage. On the satellite image taken on 14 August, Forensic Architecture detected one crater about 120m south-west of the hospital and three craters about the same distance north-east of the hospital. Patients, staff and persons seeking refuge at the hospital proceeded to evacuate the building in a rush when the attacks intensified. An organized evacuation took place in the evening. By about 7pm the hospital was closed and reporters claimed that the entire neighbourhood around the Abu Youssef al-Najjar hospital was under artillery fire. On the same day three ambulances from the hospital went to collect wounded people near a mosque in Rafah; one ambulance was hit and completely destroyed by what appeared to be three drone-launched missiles. The three medics and all the wounded within the ambulance were burnt to death. A second ambulance left, while the other, which remained to collect the wounded and dead, was hit by another apparent drone strike. A video animation that locates multiple images and videos of Israeli attacks in Rafah on 1 August 2014 in a digital three-dimensional model. © Forensic Architecture. The pounding of Rafah continued for three days after the initial strikes of 1 August, even after Lieutenant Goldin was declared dead by an Israeli rabbinical court and buried on 2 August. There is overwhelming evidence that Israeli forces committed disproportionate, or otherwise indiscriminate, attacks which killed scores of civilians in their homes, on the streets and in vehicles and injured many more. This includes repeatedly firing artillery and other imprecise explosive weapons in densely populated civilian areas during the attacks on Rafah between 1 and 4 August. In some cases, there are indications that they directly fired at and killed civilians, including people fleeing. Public statements by Israeli army commanders and soldiers after the conflict provide compelling reasons to conclude that some attacks that killed civilians and destroyed homes and property were intentionally carried out and motivated by a desire for revenge – to teach a lesson to, or punish, the population of Rafah for the capture of Lieutenant Goldin. There is consequently strong evidence that many such attacks in Rafah between 1 and 4 August were serious violations of international humanitarian law and constituted grave breaches of the Fourth Geneva Convention or other war crimes. The UN Independent Commission of Inquiry on the 2014 Gaza Conflict examined the Israeli army attack on Rafah on 1 August and also raised serious concerns about the conformity of the Israeli army actions on that day with international law. The Commission investigated attacks it considered disproportionate or otherwise indiscriminate and found that some might amount to war crimes. The Commission also concluded that the Israeli army did not appear to have taken precautions to verify that targets of attacks were lawful military objectives and to choose the weapons which could avoid or minimize civilian casualties and destruction to civilian structures. Israeli army commanders and officers can operate in confidence that they are unlikely to be held accountable for violations of international law due to the pervasive climate of impunity that has existed for decades. This is due, in large part, to the lack of independent, impartial and effective investigations. Despite the massive toll that Operation Protective Edge had on civilians in Gaza, almost one year after the conflict, military prosecutors have indicted only three soldiers for one incident of looting. A significant number of cases have been closed on the basis that no crimes were committed (the main reason given in such decisions) or that there was insufficient evidence to indict. With regard to Israeli army operations in Rafah between 1 and 4 August, the Israeli authorities have failed to conduct genuine, effective, and prompt investigations into any of the allegations of serious violations of international humanitarian law documented in this report, let alone to prosecute individuals, including commanders and civilian superiors, suspected of committing or ordering related crimes under international law. The authorities have failed to ensure that victims have effective access to justice, or to provide them with full and prompt reparation, including restitution, compensation, rehabilitation, satisfaction and guarantees of non-repetition. The events need to be independently and impartially investigated. Amnesty International’s view is that no official body capable of conducting such investigations currently exists in Israel. It is therefore calling on the Israeli authorities to: co-operate fully with the ongoing preliminary examination by the Prosecutor of the International Criminal Court into the situation in the Occupied Palestinian Territories and any future investigations or prosecutions; reform their domestic mechanisms for investigating allegations of violations of international humanitarian law to ensure that it is independent, effective, prompt and transparent; allow human rights organizations access to Gaza to investigate suspected violations of international law by all parties to the conflict; and immediately and fully lift the blockade imposed on Gaza since 2007. Amnesty International is also asking the international community in general to support the role of the International Criminal Court in examining allegations of crimes under international law including those documented in this report, and to pressure the Israeli and Palestinian authorities to co-operate fully with the Office of the Prosecutor. All states should oppose punitive measures against Palestine for joining the International Criminal Court or for submitting information on Israeli violations to the Court or taking other steps to activate international justice mechanisms.